I have a confession to make to you. These biscuits have a secret ingredient: whole wheat pastry flour. I love the flakiness of a good biscuit, but they’re frequently made with lard and I just can’t get over that. 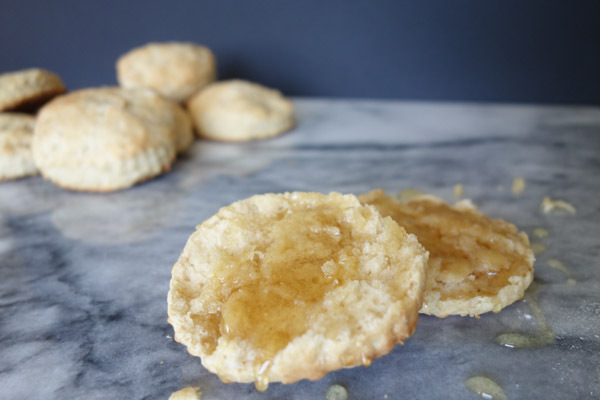 This biscuit recipe is lightened up by using the whole wheat pastry flour and leaving out the lard, but it still has the buttery flakiness I love. They’re reminiscent of the southern biscuits I ate during college in Texas (isn’t that where the Freshman 15 comes from?). There is no wrong way to eat these biscuits. This recipe is for rosemary buttermilk biscuits, but you can easily omit the rosemary and you’ll have a fantastic buttermilk biscuit recipe. Many people find biscuits to be intimidating, but I promise you can do this. Begin by mixing all of your dry ingredients in a medium bowl, including the rosemary. This recipe calls for whole wheat pastry flour and all-purpose flour, but you could use only all-purpose flour if you do not have whole wheat pastry flour. I found the biscuits are too heavy using regular whole wheat flour. If you use white whole wheat flour, use a little less than a cup. Cut the butter into 1 tablespoon pieces, then cut each 1 tablespoon piece into quarters. Add the quartered butter into the dry ingredients. You know how your mom told you not to play with your food? Well, now you’re going to play with the food. Don’t be afraid. 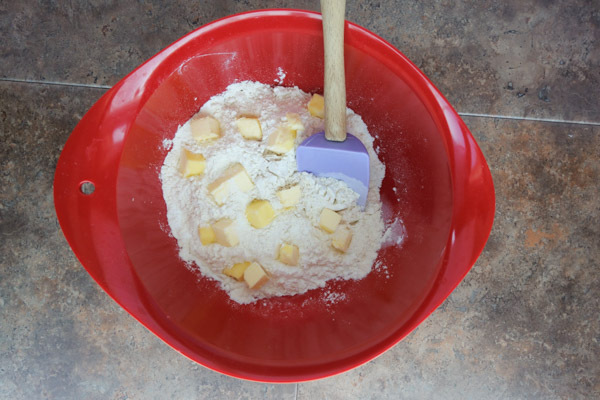 Use your hands to quickly mix the butter into the flour mixture. I say quickly because you don’t want the butter to melt. There will be some chunks once you’ve incorporated the butter. Once the butter is mixed in, form a hole in the middle of the flour mixture. Pour the buttermilk into the hole, stirring as you pour it in. If you don’t have buttermilk on hand, don’t fret. You can make an easy substitute by mixing one cup of milk with 1 tbsp of white vinegar or lemon juice. Let it sit for a few minutes and you will have created a buttermilk substitute like a buttermilk wizard. When the buttermilk is mixed in, the dough will be sticky. The more you work the dough, the less light and fluffy your biscuits will be. So, do not overwork the dough because we are all about the fluffiness when it comes to biscuits. Roll the dough out onto a lightly floured cutting board or pastry board. The thickness you want for your biscuits will dictate how thick you roll the dough. I rolled mine to be about 3/4 inches thick. If you would like a really thick biscuit, roll the dough to be an inch thick. 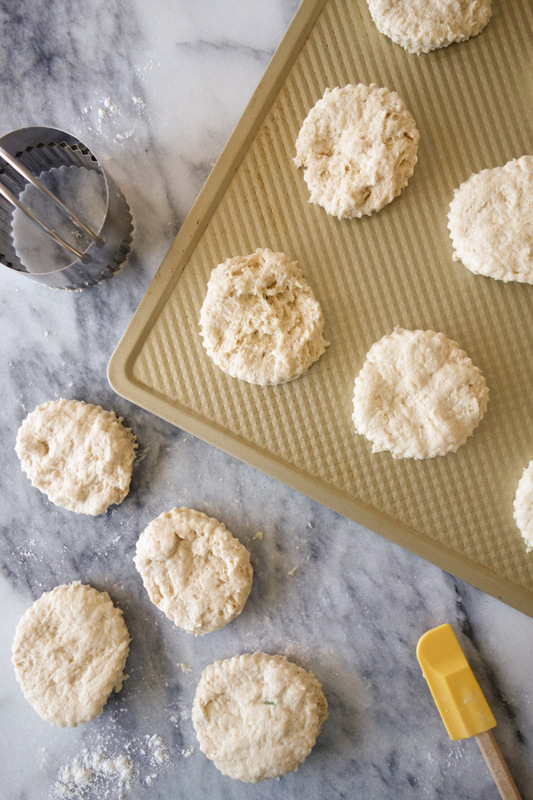 Once you roll out the dough, use a lightly floured biscuit cutter to cut the dough into biscuits. Place the biscuits on an ungreased baking sheet. 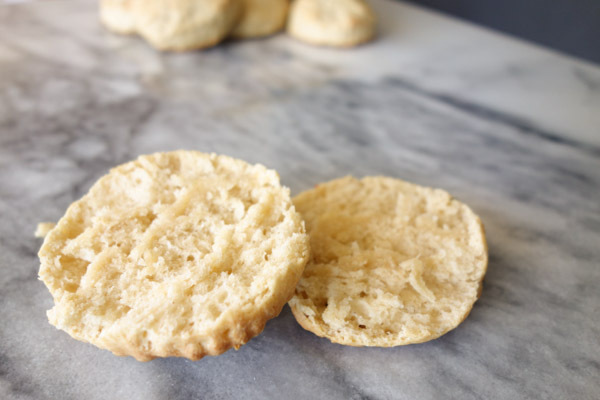 If you don’t have a biscuit cutter, lightly flour a cup and use the mouth of the cup to cut the biscuits. Bake the biscuits for 15-20 minutes or until the tops are golden brown. Serve immediately. Cut butter into 1 tbsp pieces and cut 1 tbsp pieces into quarters. Quickly mix butter into dry ingredients. You may need to use your hands to work the butter in. Form a well in flour mixture and pour in buttermilk. Stir until buttermilk is absorbed into flour mixture, the dough will be sticky. Do not overwork the dough. Place dough on lightly floured surface. Roll out dough to thickness of 3/4 inch or 1 inch. Using a floured biscuit cutter or mouth of a glass, cut biscuits. Place biscuits on ungreased baking sheet. Bake biscuits for 15-20 minutes or until tops are golden brown.